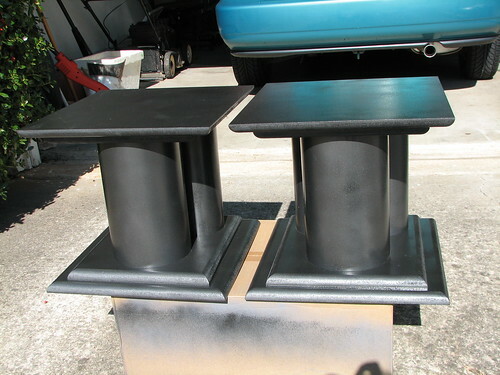 TV stand - paint it flat black or hammered metallic black? 1. Flat black with a clear coat over it. 2. Rustoleum's Hammered Metallic paint (hides imperfections). I was worried about stray reflections from the panels paint with the hammered metallic paint while viewing TV. I'm assuming you mean the Hammered Black for #2. From a purely aesthetic standpoint, that is the one I would go with. I don't think there would be much in the way of reflections. I have glass beneath my television, and I never notice it. I only worried about reflections with my projector. With a TV I would just paint the stand with whatever you like the best. I think I'm going to end up doing a combination of both: use flat black for the bottom sides, and black hammered on the top surfaces for both layers. Krylon Fusion. Available in Black Hammered, # 2531. 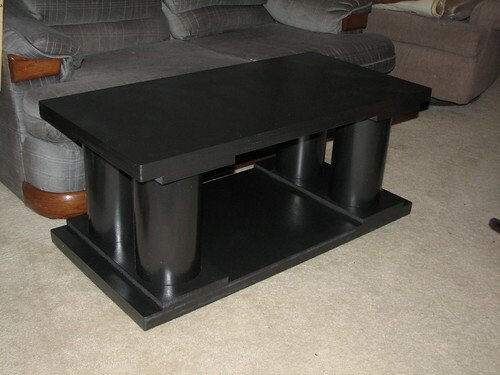 I tested the Rustoleum black hammered paint, and it works well enough for the PVC pipes, without sanding or primer. I was surprised. But I will have to try the krylon stuff because I have more speaker stands that use PVC pipes as well, so thanks for the tip! I'm almost done with the paint process. Just need one more can of the hammered metal paint for the top surfaces and I'm done. I'd forgotten what a pain it is to paint stuff (very messy sometimes). Oh course, I go through all this trouble, and then see a nice stand at Target for $78 that would have been just want I needed dimension-wise. I added more photos on the paint process to the same photo set listed before (in the last 9 photos for the set). I put together some DIY speaker stands way back in late 2002 with left over PVC pipes (4" and 6" diameter pipes) from my subwoofer projects, and it wasn't until I did my DIY TV stand that give me no more excuses to finally paint the speaker stands, so that's what I did last weekend, and then I let the paint dry for 6 days (hopefully so that the paint on the bottom sides won't be left on the carpet when/if I move the stands elsewhere later. Here's a collection of photos dealing with the painting process. I would still put something underneath the stands to protect your carpet. I've had problems with stuff I've painted myself getting on the carpet after a few years. What would you suggest? Cloth or paper? Paper should do the job. Thick one is preferrable in case the paint seeps in, or you can always use two layer of newspaper. For now I ended up using some month-old Microcenter flyers, but then I sort of wondered if the ink from the flyers would somehow transfer itself to the carpet from the weight on it.